Darlene Dolich hits a return during the championship match. 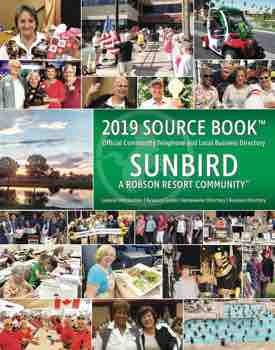 The end of another hot summer is in sight, and we are excited for double-digit temps at SunBird. 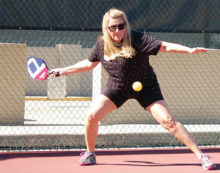 SunBird Pickleball Club President Marianna Buescher is excited and looking forward to seeing all of the outdoor activities around SunBird starting to pick up in the next few months. The SunBird Pickleball Club held an End of Summer Pickleball Tournament and invited friends from Trilogy and Solera over-55 communities. The mixed-doubles competition was very well attended, and a great time was had by all. 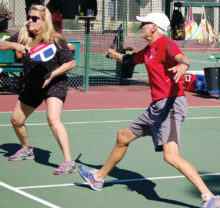 Games started around 6:45 in the morning, and round-robin play was completed by 9:15 a.m.
Pete Prucha was the tournament coordinator and set things up to accommodate two brackets of eight teams each for the mixed-doubles games. 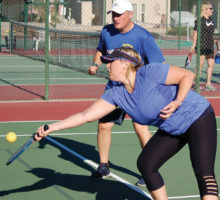 This meant each team would play seven games, and the bracket winners (team with the most points after seven games) would play for the SunBird Summer Pickleball Mixer Championship. The championship match pitted Amy and Matt Ricciardi against Bob Dunst and Darlene Dolich. It was an exciting match filled with great play by both teams, but in the end, Amy and Matt were crowned Champions of the first annual SunBird Summer Pickleball Mixer. Thanks to Pete Prucha, SunBird pickleball resident and local representative for Gearbox Pickleball Paddles, we completed 113 matches in just under three hours, using the six pickleball courts. Thanks, Pete, for a job well done. Many thanks also go out to Marianna and Dan Buescher and the group of volunteers who all pitched in to organize the event. If you thought the SunBird Pickleball Club had fun this summer, wait for the fall/winter schedule to kick in, and as our part-time residents come home for the winter, we are going to crank-up the “Fun-Meter” on the pickleball courts. As we get ready for the fall/winter schedule, here is some pickleball specific information for you. Fall/Winter Schedule Pickleball Club play starts on Tuesday, October 31. Tuesdays and Thursdays – 2:00-5:30 p.m.
Saturdays 8:00 – noon on the following dates: October 7 and 21, November 11 and 25, December 9 and 16, January 6 and 13, February 3 and 17, March 3 and 17, April 7 and 21. 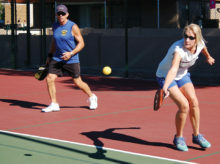 Dates for pickleball clinics will be announced in the November issue of the SunBird News.